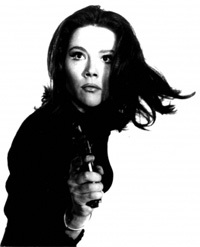 Emma Peel paved the way for so many of today’s strong heroines in movies, TV shows and books. Unlike so many female characters before and after her, Peel was admired because she could show weakness without being considered a weak character and could be rescued as well as do the rescuing. Even more interesting, according to Francis Hui, Rigg and Steed used to write their own witty dialogue. As a married woman, Mrs. Peel came across as sexually experienced and was yet not defined solely by her sexuality. Becca at Pop Culture Heroines points out that Peel was “a force to be reckoned with; smart, beautiful and capable.” What more could a girl ask for? I’m glad you liked the post over at Pop Culture Heroines! You have a pretty cool blog here. Thank you very much! Please visit again. I love Pop Culture Heroines too.